I'm about to get really honest with you, my friends. It's been a bit since I've blogged consistently, and that's because this pregnancy has rocked my boat. Pregnancy is beautiful and magical, but if I didn't mention the flip side of it, I wouldn't be giving the whole picture...at least from my perspective. So before I let the walls down and share, let me preface that I know not everyone will share my feelings, while others will find solitude in them, and that is quite all right. This blog of mine is a place where I come to be honest with each of you, giving you a little insight into my life and thoughts, hoping to connect in one way or another with my readers. I hope my message isn't misconstrued, but I know there is a very good possibility it can be. Just know this is a piece of my everyday that I want to be vulnerable and transparent with you about as I come to the end of my pregnancy. It doesn't forsake the feelings of others, but only lends a glance into my experience. Over the last couple of months I have turned into quite the complainer when it comes to just about anything, but mostly how I'm feeling as a pregnant mama. My body hurts, it's too hot, I'm swollen, my clothes don't fit (none. of them. ), I feel fat, and so on. I'm irritable like you wouldn't believe, overly emotional/sensitive, and downright uncomfortable. Pregnancy can be quite a bear. Especially this one, which has been so very different than my previous pregnancy with Greer. 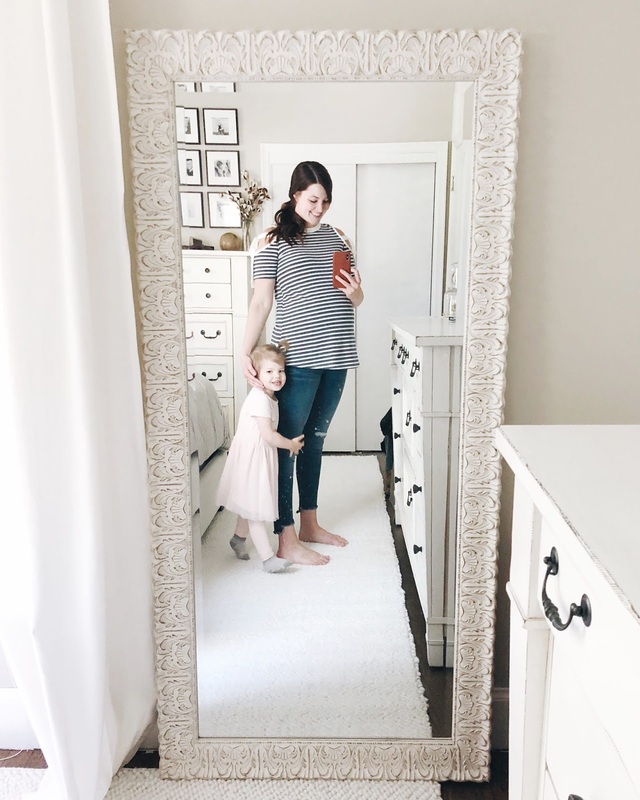 The blessing of carrying a child is not lost on me, and I'm more thankful than words can describe, especially after experiencing a miscarriage during my first pregnancy. But while this precious gift grows inside of me, I find myself with a whole bunch of complaints. Because after all, I'm human and sometimes complaining is just a little bit freeing. Let's get right to it. What do I complain about? First let's talk about bending over to pick something up. At this point in the game, I hate needing to grab something up off of the floor. There's no good way to go about it. And the worst is when I have finally decided to bend over to get it, and drop it as I'm standing back up. It makes me want to drop an ugly word too. More often than not, my clumsy, pregnant fingers drop it 2-3 more times before I actually secure it, and nothing makes me want to growl more and chuck said item across the room. How about the massive pressure on my bladder that keeps me running to the bathroom at all minutes of the day. I have to pee all the time, even two minutes after I've already visited the ladies' room. It wakes me while I'm sleeping (and I say "sleeping" lightly). Not just once. Usually twice. Sometimes three times. It's maddening, y'all. Or the way that my loosening ligaments stop me in my tracks so my legs don't buckle out from under me and crash me to the floor. And my pelvic floor, I think one of these days it's just going to fall right out. Sleep. Yeah, that doesn't happen anymore. Whether I have four pillows in the bed to help prop me up, hold me into position, or stick between my legs, nothing seems to truly work. I doze throughout the night, which leaves me waking up from my light cat nap(s) feeling exhausted. Not to mention the tiny dancer growing in my belly loves to move throughout the night too. And her little legs and arms love rubbing up and down my side with swift and strong force. It's a real treat. Oh, how I dream of sleeping through the night (maybe in 2019) and rolling onto my belly to snooze away. Breathing, or getting in a full breath of air, isn't something I will take for granted once this little lady has arrived. I'm winded constantly. You should hear me trying to catch my breath after attempting to pick up the same item off the floor over and over again. You would think I just climbed a flight of stairs....up ten floors. And how about having your breath taken away when one of those baby legs gouges into my ribs or punches hard at my side. Oh baby, there's nothing like it! Then there's the sciatic nerve pain that creeps from my lower back, through my bum, and down into the top of my leg. There's nothing like that pinching sensation to remind you of all the extra weight you're toting around. Doesn't matter if I'm standing or sitting, that nerve loves to give me trouble. And so does restless leg syndrome, that has popped up in the last several weeks. Paired with leg cramps, I can tell just how much leg muscles really love me. Sitting up, standing up, chasing after a toddler. Don't get me started about trying to get up off of the floor. It's comical to watch, I'm sure, and a multi-step process for me. My ability to move with ease is really long gone. I feel like I've forgotten what it's like to move without a belly. You know what else I've forgotten...what it's like to have an appetite. So far, it's not come back from my first trimester aversions, and it makes me grumpy. I just want to actually crave dinner, and not just eat something because I need to. At this point, I wonder if it's ever coming back. There is normalcy after pregnancy, right?? All this to say, or really complain about, also leaves me very excited to meet our growing girl. With four weeks left, give or take, and I'm hoping there are less, I know I'll survive. And that I'd chose this all over again just for her. It's amazing to me what a female body is capable of, and I'm in awe at its ability to nurture and grow life. Now if only pregnancy could be a walk in the park! I'll redeem these complaints come August, when I've started settling into my new norm, post pregnancy. You know I'll be gushing and these discomforts and irritations will be a thing of the past. Hold me to it, will you?